Central to The Stone Trust’s mission is increasing awareness about the best ways to preserve and construct dry stone walls and structures. Historically very rich, we have much to learn from the common sense, low-tech practices of our forebears. The Stone Trust seeks to protect the stunning legacy of down-to-earth stone work. Looking to the future, we daily make far-reaching decisions about how we live on the planet. We think about building on the past, about stepping forward into a future lightly. These thoughts lead us to plan carefully, to wonder about land use, about best building practices, about shaping a future that can last naturally. The Stone Trust’s mission calls for advocacy, for creating greater awareness, for improving legislation, for protecting the future. Stone is the oldest construction material known. Dry stone walling, as a practical art and craft, stretches back at least three and a half millennia. Ancient drystone structures are found round the world: Egyptian pyramids, Peruvian temples, prehistoric dwellings from the Shetland Islands to the eastern Mediterranean. Drystone structures constructed to support agriculture are equally ancient and widespread. In the United States, especially in eighteenth and nineteenth centuries New England, European settlers cleared land of trees and stone to plant crops and more readily graze animals. The monumental numbers of stones dragged from fields and perched into walls stands as a stunning testament to ingenuity, hard work, and dogged commitment. For agriculture: In the 18th and 19th centuries, American farmers used readily available stone to construct dwellings, barns, spring houses, smoke houses, and ice houses. For shared community uses: Town governments, congregations, and private developers created stone court houses, clerk’s offices, banks, shops, inns, and churches. For transportation and industry: Governments and developers built drystone mills, dams, bridges, stream and pond borders, retaining walls at stream banks, road cuts, railway piers, embankments, and bridge piers and abutments. Today, perhaps the most widely-recognized drystone structures are the miles and miles of stone walls and rock fences that border fields, pastures, and roadway. Today, a greater awareness of the art and craft of dry stone walling awakens appreciation, even wonder, in the environmentalist, farmer, historian, landowner, conservationist, and onlooker. Rather than being lost to the modern mind, dry stone walls can play a role in shaping our understanding of the landscape’­s history as well as our roles as stewards going forward. In New England, where dry stone walling has been practiced for over 200 years, it has been asserted that the amount of stone moved and the manpower hours expended exceeds that of those to construct all the pyramids of Egypt! With an honest interest in solid quality work, The Stone Trust advocates for the consistent upgrading of legislative language around the issues related to dry stone wall protection, preservation, and construction. Language and code for dry stone construction and preservation differs from state to state. 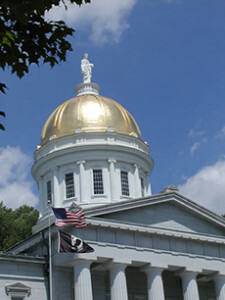 The Stone Trust has researched several states’ legislation and, beginning with Vermont, has developed language that supports the highest standards, as developed by the Dry Stone Walling Association of Great Britain. Continued recommendations for legislative language upgrade remain an ongoing interest of the The Stone Trust.